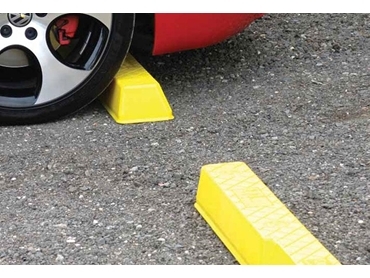 Sitecraft has introduced new compliant one-piece wheel stops that have been designed to comply with AS2890.1:2004, and manufactured from high-tech Linear Low Density Polyethylene (LLDPE) with sustainability in mind. These one-piece wheel stops are packed with features never seen before in a wheel stop anywhere in the world. They will not fade, rot, rust or crack and come complete with matching blanking plugs to conceal the fixing points. Compliance is available in 3 standard U.V. stabilised colours - Safety Yellow for increased visibility and pedestrian safety, Blue for highlighting disabled parking spaces and Grey. moulded-in sign recess allows for personalised signage. The Association of European Plastics Manufacturers notes that Polyethylene can be manufactured relatively cleanly and efficiently, with minimal emissions of harmful substances and hardly any waste. In addition, being a thermoplastic material it is extremely suitable for recycling, as it can be melted unlimited times and moulded into new products. Combined with its excellent durability, safety and hygiene, this makes Polyethylene the ideal material with which to manufacture environmentally sustainable wheel stops.